Want to add a stylish quotient to your dressing area? Check out the beautiful dresser mirror from the Texas collection. With a full-length mirror, two multi-utility hooks, an easy sliding door, and three glass shelves, this dresser mirror is a useful addition to your bedroom. Made of compressed wood, this dresser mirror displays a deep brown tone and a matte finish exterior which adds a simple rustic charm to the furniture. A classic full-length mirror and a unique rustic styled dresser. It simply doesn’t get better than the Texas Engineerwood Dresser Mirror. 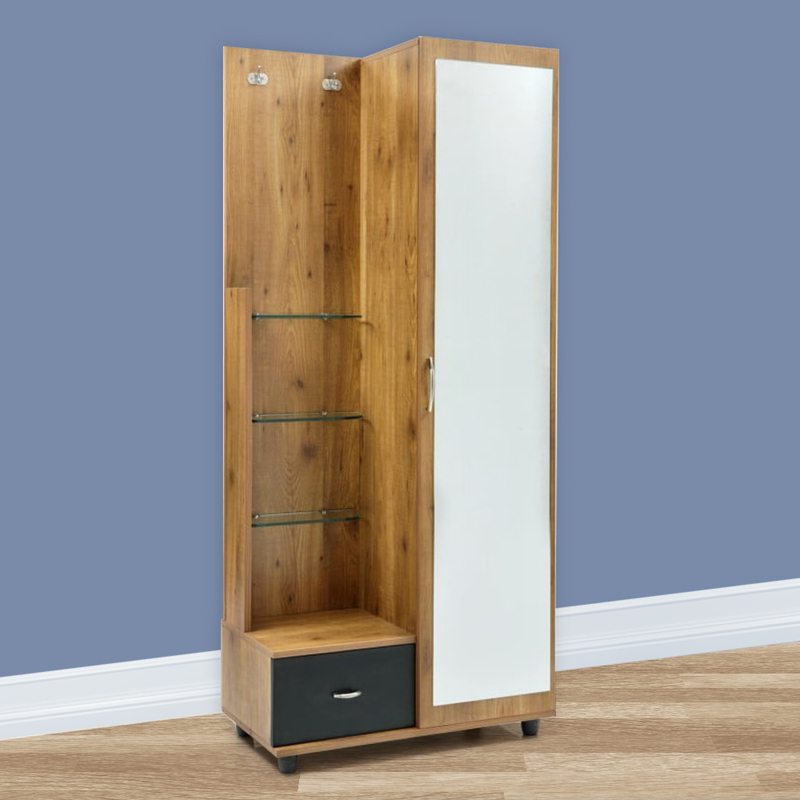 Made from high-quality compressed wood, this dresser features two multi-utility hooks for your scarves and jackets and three glass shelves for displaying your finest perfumes, ornaments or showpieces. The dresser also has an easy sliding door, that Add to this, a convenient storage option in the form of a large pull-out cabinet. It’s natural brown tone and classic matte finish contrast with the metal handles and fitments, defining rustic elegance. You can choose to buy this piece from our online furniture site, or visit any of our 25 furniture stores across India for the best deals in home furniture.